The curriculum fills a gap between introductory computer science educational materials available for grades K-8 and the rigorous Advanced Placement courses that the most advanced students might take later in high school, said David Kosbie, an associate teaching professor and co-director of the School of Computer Science's new Computer Science Academy. Carnegie Mellon has launched a free, online curriculum for high school students that helps instructors teach programming skills using engaging graphics and animations. "This isn't 'drag and drop' programming," Kosbie said. "We're teaching them to use Python, a text-based programming language that is the most widely taught language at the university level." Python also is one of the most popular programming languages in industry, used by such organizations as Google, Amazon and Facebook. The CS Academy was established and its CS1 curriculum developed in response to requests from secondary school teachers and principals, who face growing demands from parents for computer science education but must cope with a lack of educational standards for computer science, a paucity of trained teachers and limited teaching materials. 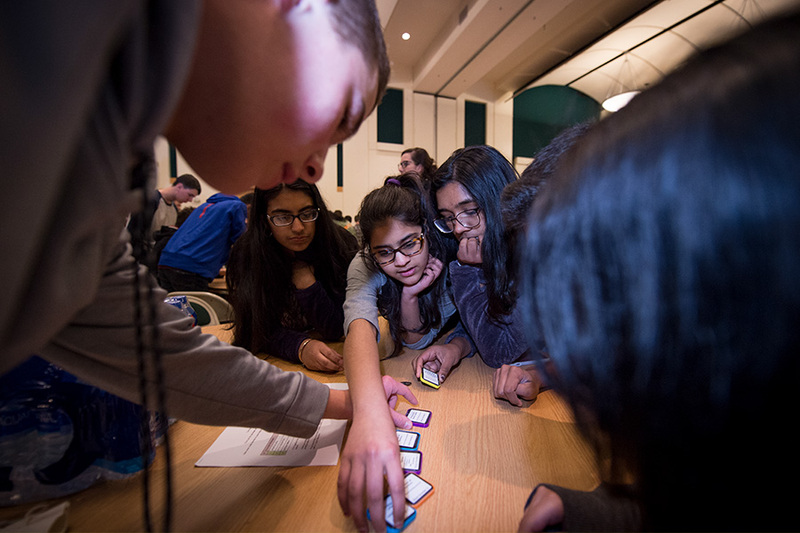 Students from Pittsburgh area high schools piloting the Computer Science Academy’s new curriculum participated in puzzle-solving challenges at CS1 Day last spring at CMU's Pittsburgh campus. Now being piloted in 40 schools, CS1 will be available for general use this fall, free of charge. It is designed for use by classroom teachers, not as a self-guided online course. One of CS1's distinctive features is graphics and animation exercises for each unit that were developed by dozens of Carnegie Mellon computer science students. "Most of the students involved in the project are just a few years older than the high school students who will be using CS1," said Erin Cawley, program manager for the CS Academy and a former K-12 computer science educator. The idea, she explained, was to make the exercises as engaging and fresh as possible. Focusing the exercises on graphics also pays dividends in the educational process. "The hardest part of programming for many novices is debugging" — finding errors in programs and fixing them, Kosbie said. "With graphics, it's easy for students to see what went wrong. 'Oh, the ear shouldn't be on the forehead, it should be over here.'" CS1 includes a number of tools to aid teachers, including an image inspector tool that can show the teacher where in an exercise a student is having trouble. Exercises also are graded automatically, freeing up the teacher's time for instruction. Cawley said the curriculum is useful to teachers regardless of whether they have experience in computer science. Extensive teacher training and online support is available through the CS Academy. Though appropriate for any level of high school, CS1 is the first in a planned four-year sequence of coursework and ultimately is envisioned as a ninth-grade course. CS1 was initially piloted in 14 high schools with 400 students in 2017-2018. The pilot program was expanded by 26 schools and another 1,300 students during the current school year. Most of the schools are in western Pennsylvania, but others are in such states as Texas, New Jersey and Washington. Mark Stehlik, SCS assistant dean for outreach and co-director of the CS Academy, said the curriculum isn't easy, but students in the pilot schools have had notable success, including those who attend under-resourced schools. 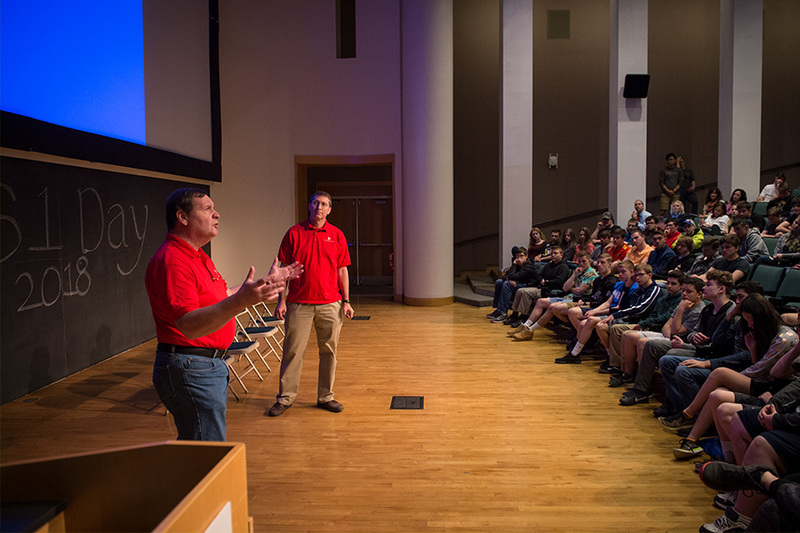 Mark Stehlik, left, and David Kosbie, co-directors of the School of Computer Science’s Computer Science Academy, address students from 13 Pittsburgh-area high schools who were participating in a pilot study of the academy’s new computer science curriculum last spring. The CS Academy is supported by SCS and by gifts from Seth Merrin, philanthropist and the CEO of the institutional equities marketplace Liquidnet; and from former Pittsburgh Steeler Franco Harris. Merrin established Rwanda's Agahozo-Shalom Youth Village for students orphaned during or after the Rwandan genocide, which is one of the schools now using CS Academy.